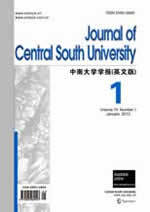 Journal of Central South University(ISSN 2095-2899, CN 43-1516/TB) (formerly named Journal of Central South University of Technology, ISSN 1005-9784, CN 43-1231/TD) is a comprehensive academic English journal, administrated by the Ministry of Education of China, sponsored by Central South University, and jointly published by Central South University and Springer. It was founded in November 1994, published semi-yearly in 1995-1999, quarterly in 2000-2004, bimonthly in 2005-2011, and will be published monthly from 2012. The Journal is mainly devoted to publishing academic papers and reports that are of creativeness and present the latest achievement of scientific research in such fields as geology, mining, metallurgy, materials, chemistry and chemical engineering, mechatronics, information, construction, traffic, transportation and environment. The columns of the Journal include: Materials Science and Engineering, Metallurgy, Chemistry and Chemical Engineering; Mechanical Engineering, Control Science and Information Engineering; Energy and Power Engineering, Environmental Engineering and Mine Engineering; Engineering; Geological Engineering, Civil Engineering, Traffic and Transportation Engineering. The Journal is covered by several famous information retrieval systems and databases, including SCI Expanded, EI Compendex, Chemical Abstracts, Metal Abstracts, Aluminium Industry Abstracts, INSPEC, CSAC, CNKI and WANGFANG DATA. The Journal was consecutively awarded “The High-quality Scientific Journal in Chinese Universities” by the Ministry of Education of China in 2006, 2008 and 2010. Now, the Journal is in its quickly-developing period both in quality and quantity, and has become one of the most influential English journals in China.